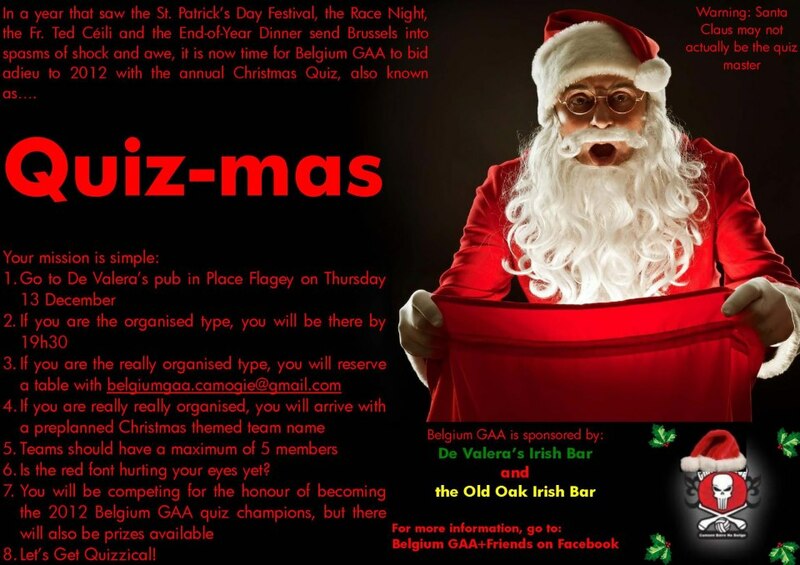 In case you missed it, tonight will be the very last Belgium GAA event of 2012, the Christmas quiz in De Valeras. Contact the lovely Christine O’ Gorman (belgiumgaa.camogie@gmail.com) if you want a last-minute registration for your team. That’s it – no more end-of-season dinners, no more Race Nights, no more Fr. Ted Céilis and no more St. Patrick’s Day Festivals. Until 2013, that is, when it starts all over again with the Annual General Meeting (AGM) in the European Parliament on 30 January (tbc). Watch out here, on the Belgium GAA+Friends FB page, on Twitter and in any emails you receive from the code officers in the coming weeks for more information, as you will need to submit your details to get a pass for the Parliament. During the meeting the 2013 committee will be elected. Any club member is entitled to put their name forward for any of the positions on the committee. I have listed them below for your information. Those in red are committee members who have indicated that they will not stand for re-election in 2013. As you can see there are alot of positions which need to be filled! If you are interested in any of these roles, and why wouldn’t you be, please contact Jane Brennan (secretary.belgium.europe@gaa.ie) no later than 10th January 2013 to declare your interest. Being a committee member is a rewarding role, and this year’s committee deserves its just rewards. It is always good to have fresh faces and fresh ideas, but the beauty of a revolving committee is that the old committee members are still around to give support and help where needed. Between them and the rest of the reliable club members who are willing to provide their time and expertise, there is no excuse for 2013 not to be as productive and prosperous for the club. Please click here to see some descriptions of the various roles – these descriptions were made by the officers themselves and the roles are constantly evolving. Finally, if you have made it this far, you deserve a little flashback on Belgium GAA in 2012. Yes – it’s the little slideshow that could (or could not, depending on where you were on the night of the end-of-season dinner). Enjoy, good luck tonight, happy Christmas and see you all in the New Year! !